Carnival Cruise Lines and Royal Caribbean International offer year-round cruising from the Cruise Maryland Terminal, located just off Interstate 95. Passengers can leave right from Baltimore and head to the Bahamas, Bermuda, the Caribbean and New England/Canada. The Cruise Maryland Terminal is 2.5 miles from Baltimore’s world-famous Inner Harbor, 10 miles from BWI Thurgood Marshall Airport, and within 1.5 hours of two other major airports. The Port is also within a six-hour drive of 40 million people. It is the closest East Coast drive-to port from Pittsburgh, Cleveland, Indianapolis and Chicago, and is within a three-hour drive from the New York City metro area. Maryland’s median household income is the highest in the United States. Baltimore is also located within a four-hour drive of eight of the 10 wealthiest counties in the nation. The Baltimore-Washington, D.C.-Northern Virginia region is recognized as one of the most affluent in the nation. Come early or stay late and experience Baltimore’s historic charm, world-famous Inner Harbor, quaint neighborhoods and exquisite restaurants. Contact your travel agent to make your reservations. 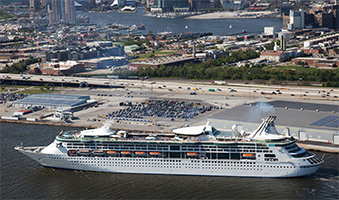 For scheduled cruise dates from the Port of Baltimore, go to www.cruisemaryland.com. Passengers will find easy access to the Cruise Maryland Terminal by private car or taxi. The Cruise Maryland Terminal at South Locust Point (SLP) is located at 2001 East McComas Street, Baltimore, MD 21230. Traveling from points south: Follow I-95 North to Exit 55, Key Highway. Once you exit, stay straight for approximately .08 miles on East McComas Street. Cruise Maryland Terminal’s entrance is on the right. Traveling from points north: Follow I-95 South through the Fort McHenry Tunnel. Be sure to be in the far right lane (Bore #1) when going through the tunnel. Take Exit 55, Key Highway. Turn left at the traffic light (traveling under the overpass) onto East McComas Street. Cruise Maryland Terminal’s entrance is approximately 350 feet on the right. Traveling from I-83 South, merge onto I-695 East via the left exit toward Towson/New York. Travel 9.3 miles and merge onto I-95 South via Exit 33A toward Baltimore/Washington. Continue as above. Traveling from points west: Follow I-70 East toward Baltimore. Merge onto I-695 South (Baltimore Beltway) via Exit 91A. Travel 5.2 miles and merge onto I-95 North via Exit 11A. Travel I-95 North for approximately 4.9 miles to Exit 55, Key Highway. Once you exit, stay straight for approximately .08 miles on East McComas Street. Cruise Maryland’s Terminal entrance is on the right.